Formed in 1984 when John Beech and neighbour Norman Hicks started playing on their back lawns with several friends. 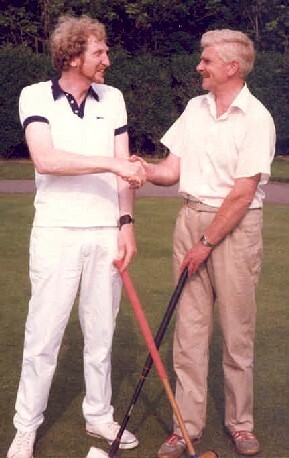 The Croquet in Pendle Club was officially registered with the CA in 1985. Early 1986 the Club started playing on 2 lawns at the Nelson and Colne College in Barrowford. Restricted hours of play were imposed;only 3 hours in the evenings and 7 hours at the weekends. It began to taste success immediately. This prompted a successful recruitment drive resulting in the CA awarding the Club the Apps Heley trophy for the most progressive Club in 1986. The success and the resulting publicity opened the door for longer playing hours and provided the opportunity for the members to pit their skills against other teams. The Club joined the NWFCC and Northern Leagues 1987 & 1988 respectively for the first time. It won the league title in its first year on both occasions. 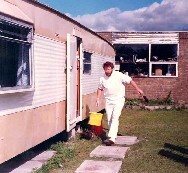 The mobile caravan club house In 1994 the Club opened an extra 2 lawns at the College, but an arson attack on the "mobile caravan club house" necessitated the provision of a more "grand pavilion" which was duly opened in 1995. All was well and the Club was enjoying success on and off the field of battle when the College decided that it needed the space where our pavilion was sited. 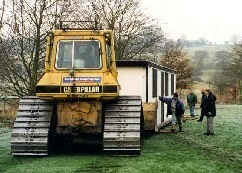 It was agreed that a suitable spot in the same field but backing onto the nearby river was just right for the new location, so the services of a massive bulldozer and several "roller logs" were employed to move the pavilion and veranda into place. Careful site planning enabled the Club to add another lawn to make a total of 5, although this last lawn was subject to flooding during the monsoon season. Nothing lasts forever so the Club were shocked to hear that the College expansion plans decreed that our lawns were needed for building space so a move and relocation became a real necessity. Eventually a new location was found and with much hard work and fund raising a much larger pavilion with all services was erected and the lawns laid out. This new location in Earby provided the space for 5 lawns and adequate car parking space, however as the Club was now located in another region it was felt that a new name for the Club should embrace both regions. The chosen name was Pendle and Craven Croquet Club. 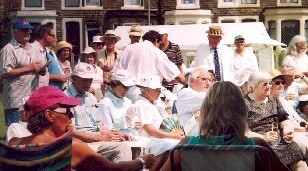 The Club held an official opening day 12 July 2005 when we were blessed with a beautiful day so that invited guests were able to try our lawns and enjoy the hospitality for which the Club is well known. Sadly our founder John Beech passed away a year later but has left us with a wonderful legacy .